"Don't be too put off by the old-school look -- these guys have a totally legit selection of frames. (Disclaimer: I'm a 40yo guy, what would I know about legit frames?) I've yet to use their services myself (got PRK a while back -- though presbyopia is surely around the corner!) but came in with a friend who was visiting and had broken her glasses. She got excellent service; they'd never seen her hexomino brand frames before, but they fixed it right up. It's the type of, well, old-school place you don't see much any more, they're obviously into their craftsmanship and attention to detail." "Dr. Bundy has been there for me since I was born! His father was once my Optometrist and his son has taken over and carries the torch for him. I couldn't ask for a more caring place to help me with my vision. They have worked with me through the years of eye disease issues, strabismus, contact lens frustrations and the hardships of finding new frames that work for a difficult farsighted prescription. This is the ONLY place that carries what I need and if they don't they help me find what I need. They are loving, caring and fun. They carry that old skool vibe when you visit there. There just isn't any other place like this in the Bay Area. I feel like my old self again after I leave this place. Perfect staff, perfect products. Thank you for always being here for me! I will forever be a customer! Love, Kate Celentano and family"
"I had a nose pad that broke off my eyeglasses which made it too painful to wear. Jose helped me out. He added two brand new nose pads and cleaned my glasses in less than 10 minutes. When I put them on, they felt great! I had a quick, hassle-free, and pleasant experience here. This is true customer service and I will be sure to bring my next pair of eyeglasses to be filled here." "A business with old-fashioned values that you hardly ever see any more. Gerry is courteous, respectful, and very patient. He has been in the business longer than I've been alive, and it shows in everything he does. I went to Bundy on the advice of my friend, who had his frames adjusted there. Even though I did not buy my frames there, Gerry took great care in adjusting them to fit my face perfectly. It was the first time I've ever had glasses properly fitted to my face. I never knew what I was missing. I can't remember the last time I received great service like that, and Gerry wouldn't accept any payment. 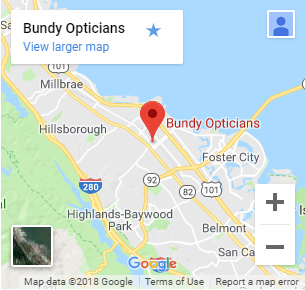 I used to get my glasses at an optometrist near where I live, but they had no idea how to adjust glasses. I will definitely get my next pair of glasses at Bundy and probably every pair after that. I am now a loyal Bundy customer." "I was concerned about getting the best peripheral vision I could with glasses, as I feel it affects my awareness of traffic at intersections, in particular. Gerry was very helpful in finding a solution to the issue. He was friendly, patient and knowledgeable about their products. I'm very happy with my new glasses!"